Are you still using ordinary method for training? If yes, then, you should be having this kind of questions in mind and issues in existence. You might have accumulated lots of worksheets with employee’s information. Human resource development is a fundamental part of business, and it is the back bone of a company. In that respect, training is a vital element. Managing employee training in a business set up with multiple work groups, featured with specific training requirements and licensing requirements is time-consuming and challenging. If a company doesn’t have a talented work pool, it will collapse in future. When we think of a reputable business, it should have a smart workforce pool. How do you offer an excellent training for them without any trouble? You should train them properly in the high time of their carrier and the firms’ operational conditions. You should know who need training and what kind of training they require. You should have proper a training schedule. It is not too late, but now it is high time to change those inefficient method of training. Have you ever tried training manager software? If not, you can get a smart solution from Harrington group international. Training Manager software is a solution for employee training and management which can primarily track employee profiles and schedules training events. The software also manages the identification, relevant responsibilities, overseeing authorities, and training and certification requirements for each employee. In order to ensure policies, procedures and work instructions followed with regard to employee training, training management software provides a pivotal role. This solution is untroublesome and equipped with high sophistication for locating, updating and cross-referencing training employee information. The software enables the training manager to devise and include training module through which training events such as questions, quizzes and self-testing and certification to update and track training competence are directed at employees. 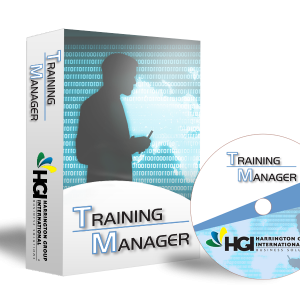 Above all, training manager software of Harrington Group international will reduce your costs by providing quick and easy access to employee training records. In addition improve your company performance by ensuring only properly trained and certified employees are assigned to for specific jobs and projects. More importantly our solutions help you to averse the risk of regulatory fines by managing training records and tracking refresher training. In short, the Harrington’s software solution helps you to develop employee’s performance by sprouting an employee’s ability, skill and knowledge.